On a bright sunny day, Age Friendly Raymond team members traveled to Augusta for a long-awaited announcement. 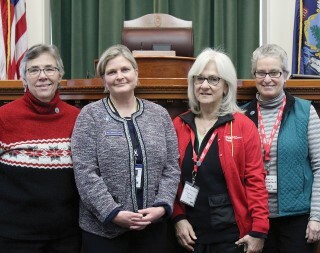 Meeting in the Hall of Flags, Susan Moore, Laurie Wallace and Sheila Bourque were welcomed by State Representative Jessica Fay and given a tour of the Capital. They were treated to a picture on the House floor with the Representative and were given Maine State pins. guests awaiting Governor Mills arrival. The housing bond, approved by almost 70 percent of Maine voters in a statewide referendum, will fund construction of more than 200 new affordable housing units for low-income seniors and the weatherization of another 100 existing homes for low-income seniors. The bond will also trigger more than $22.5 million in matching federal funds. According to the Maine Affordable Housing Coalition, more than 9,000 seniors are currently waiting for safe, affordable housing. The financial order Governor Mills signed on January 15 will allow $500,000 to be used immediately to fund ongoing projects for home repair and weatherization. Governor Mills also signed a letter to Maine Treasurer Henry Beck declaring her intent to authorize the sale of the remainder of the bond for any ready projects come June. After the press conference the team attended a meeting of the Caucus on Aging, co-chaired by Representative Fay and were given a preview of the many bills that legislators were working on for the coming session. Age Friendly Raymond meets on the second Monday of the month at 2 p.m. at the Raymond Public Safety Building.